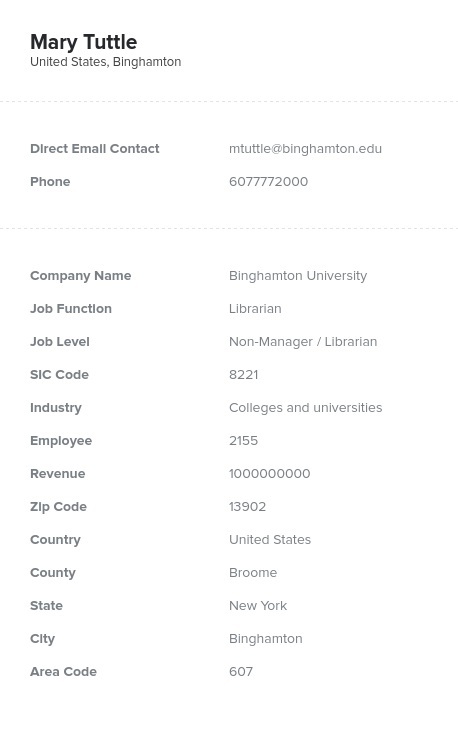 Flaunt your book, IT solution, or publishing company with this easy-to-use librarian email list, which contains all of the information you need to connect: librarians' email addresses, phone numbers, fax numbers, real names, and more. Gain access to more readers than ever! Make sure your book lands on the shelves of libraries everywhere with the help of this targeted marketing solution: an email database of librarians, which has all of the information you need. Market to an under-appreciated yet powerful group of public and nonprofit experts who have a huge influence on what gets read and when. This bulk email list of librarians is the ideal solution for publishers hoping to reach out to publishing decision-makers. It's already organized for you and ready to go; grab it here, download it, and start contacting librarians via email or phone within minutes. Leaders of the publicly accessible institutions that are so important to the fabric of society, librarians are important sales leads if you're a self-published author, representative of a publishing house, or magazine company. However, these individuals also must work hard to keep their institutions operational, organized, and safe, so a librarian mailing list would also be a great tool for those offering those kinds of solutions as well. Whatever the printed material or solution you offer, this librarian mailing list can help you make sure it's available in a huge array of public libraries. Use this one product for emailing librarians, direct mailing bookmarks and free materials, or calling. With this huge database of librarians, ensure that your materials will be read and loved by the masses today!